(AP) WASHINGTON  Already scrambling to steady a struggling campaign, Republican Mitt Romney confronted a new headache Monday after a video surfaced showing him telling wealthy donors that almost half of all Americans "believe they are victims" entitled to extensive government support. He added that as a candidate for the White House, "my job is not to worry about those people." At a hastily called news conference late in the day, Romney offered no apologies for his remarks, and when he was asked if he was concerned he had offended anyone, he conceded the comments weren't "elegantly stated" and they were spoken "off the cuff." Romney to campaign donors: Obama voters "dependent," see selves as "victims"
President Obama's campaign quickly seized on the video, obtained by the magazine Mother Jones and made public on a day that Romney's campaign said it needed a change in campaign strategy to gain momentum in the presidential race. Romney aides were already working behind the scenes to calm dissension in the GOP ranks and reassure nervous donors and consultants about the state of a race some Republicans worry may be getting away from their nominee. "There are 47 percent of the people who will vote for the president no matter what," Romney is shown saying in the video posted online by the magazine (which you can see on the left). "There are 47 percent who are with him, who are dependent upon government, who believe that they are victims, who believe that government has a responsibility to care for them, who believe that they are entitled to health care, to food, to housing, to you name it." "Forty-seven percent of Americans pay no income tax," Romney said. Romney said in the video that his role "is not to worry about those people. I'll never convince them they should take personal responsibility and care for their lives." In his remarks to reporters before a fundraiser Monday night in Costa Mesa, Calif., Romney did not dispute the authenticity of the hidden-camera footage, but he called for the release of the full video, instead of the clips posted online. He sought to clarify his remarks but did not apologize. "It's not elegantly stated, let me put it that way. I was speaking off the cuff in response to a question. And I'm sure I could state it more clearly in a more effective way than I did in a setting like that," Romney said. "Of course I want to help all Americans. All Americans have a bright and prosperous future." Mr. Obama's campaign called the video "shocking"
"It's hard to serve as president for all Americans when you've disdainfully written off half the nation," Obama campaign manager Jim Messina said in a statement. An Obama adviser said the Democratic campaign might use Romney's comments from the fundraising video in television advertisements. The official wasn't authorized to discuss campaign strategy publicly and requested anonymity. Romney's 2010 federal tax returns show he paid a tax rate of about 14 percent on an annual income of $21 million. The vast majority of his income came from investments, which are taxed at a lower rate than wages. His wealth has been estimated as high as $250 million. Democrats have tried to make an issue of what Romney pays in taxes and what he is willing to divulge about his taxes and investments. While he has released his 2010 tax returns and a summary of his 2011 returns, he has rejected calls for releasing as many as 10 years of tax returns. His campaign has pledged to release his complete 2011 returns before the election Nov. 6. The private remarks are the latest in a string of comments from the multimillionaire Republican businessman whom Democrats have criticized as out of touch. During the primary campaign, Romney insisted that he was "not concerned" about the very poor, said he knew what it felt like to worry about being "pink-slipped," and said that his wife drove a "couple of Cadillacs." Aides to Mr. Obama's campaign said the latest video would help them continue to make the case that Romney doesn't understand the concerns of average Americans. Romney said he would not shy away from the message behind the remarks  that Mr. Obama believes in a "government-centered society." "It's a message which I am going to carry and continue to carry, which is that the president's approach is attractive to people who are not paying taxes because, frankly, my discussion about lowering taxes isn't as attractive to them," Romney said. "Therefore I'm not likely to draw them into my campaign as effectively as those in the middle." Voters say they believe Mr. Obama has a better understanding of their problems and concerns than Romney does. A CBS/New York Times poll showed 60 percent of likely voters said Mr. Obama understands the needs and problems of people like them, while 37 percent said he did not. 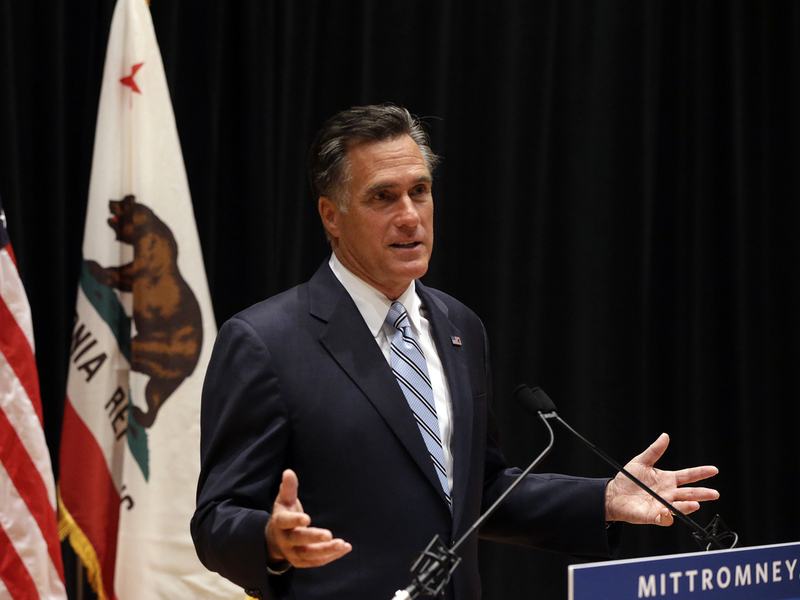 For Romney, the same question found that 46 percent felt he did understand people's needs, 48 percent said he didn't. Mother Jones writer David Corn told MSNBC that the video came from a May 17 fundraiser at the Boca Raton, Fla., home of Marc Leder, co-CEO of the investment firm Sun Capital Partners. The magazine had said earlier that the date and location of the remarks were not being disclosed to protect the identity of the person who provided the video. On MSNBC, Corn said the source had allowed those details to be released. Many of the Americans who owe no income tax are reprieved because basic exemptions  such as the "standard deduction"  took their taxable income below the cutoff levels. The other half rely mainly on a variety of tax breaks, such as the credit that helps offset child care costs. These Americans range from the very poor to solidly middle-class families with jobs, homes, cars and vacations. The Tax Policy Center says "relatively few nontaxable households" have incomes exceeding $100,000; families that make between $50,000 and $100,000 often owe no income tax because of breaks for their kids and for education. Americans who pay no federal income tax still often pay an array of other taxes. They include payroll taxes for Social Security and Medicare, sales taxes, property taxes and state and local taxes. A handful of extremely wealthy families do not pay federal income taxes. This summer the Internal Revenue Service reported that six of the 400 highest-earning households in America owed no federal income tax in 2009. Still, many are low-income Americans. According to the August 2010 AP-GfK poll, a majority of Americans who make less than $30,000 a year are Democrats. But 27 percent identify as Republicans, and 15 percent say they're independents. About 57 percent say they will vote for Mr. Obama, while 38 percent back Romney. About 43 percent identify themselves as conservatives. Mr. Obama faced a similar moment in the 2008 campaign, when he told donors that many Americans who are angry about their struggles "cling to their guns or religion." Romney's running mate, Wisconsin Rep. Paul Ryan, made reference to that remark Monday at a campaign event in Des Moines, Iowa. "I remember that one time when he was talking to a bunch of donors in San Francisco and he said people like us, people from the Midwest like to cling to their guns and religion," Ryan said. Ryan went on: "And I've got to tell you this Catholic deer hunter is guilty as charged and proud to say so. That's just weird. Who says things like that? That's just strange."